In celebration of the new original graphic novel Serenity: The Shepherd’s Tale, Things From Another World and Dark Horse Comics are hosting an epic Firefly screening and Serenity signing Tuesday, November 30 with writer Zack Whedon (Terminator 1984) and artist Chris Samnee (Thor: The Mighty Avenger) in Portland, Oregon! This event is also hosted in conjunction with local comic book shops Bridge City Comics and Excalibur Books & Comics. Special thanks go out to the Hollywood Theatre and Film Action Oregon for donating their space and time, and to the PDX Browncoats for their awesome support. Fans are invited to the Hollywood Theatre at 4122 NE Sandy Blvd. at 6:30 pm to see a rare public showing of the classic Firefly episode “Objects in Space” on the big screen! 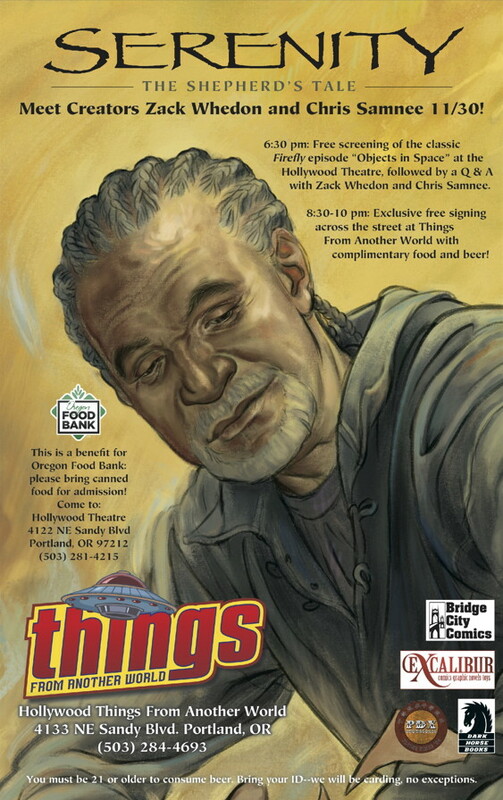 Admission is a canned or nonperishable food item for the Oregon Food Bank. After the screening there will be a Q & A with Zack Whedon and Chris Samnee. Interested parties can submit questions by posting them at Dark Horse Comics Facebook event page, visiting TFAW’s brick-and-mortar locations, or asking them at the event. Details regarding the Skype account for the live event are forthcoming. Next, at 8:30 pm, festivities will move across the street to the Hollywood Things From Another World at 4133 NE Sandy Blvd. for a free, fun-filled signing with complimentary food and beer (with valid ID–no exceptions). Copies of Serenity: The Shepherd’s Tale will be available for purchase. One of Serenity‘s greatest mysteries is finally revealed in Serenity: The Shepherd’s Tale, filling in the life of one of the show’s most beloved characters–Shepherd Book! Hope to see you Tuesday, November 30 for this once-in-a-lifetime event. Are you excited about seeing Firefly on the big screen? What about meeting Zack Whedon? Post your comments below! Next article AMC’s The Walking Dead Premiere & Costume Contest!